Clearwater, FL., November 15, 2014 – In what had been a theme throughout the 2014 Fall Classic, dominant pitching consistently defeated dominant hitting. 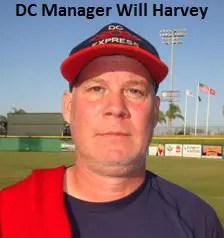 For the D.C. Express, the equation equaled a first team title. The standout pitching performance was the second straight for the Express, who received a complete-game effort from James Kent in a 10-1 blasting of the Columbus Dragons in the tournament semifinals. Against South Atlanta, Lee was just as impressive. To cap a stellar week in which he finished 3-0 in 22 innings pitched, Lee earned his second title in four years by being nearly unhittable all game. His only trouble came in the fourth, when an error led to three runs to cut the D.C. lead to 4-3. Jeff Chrismon led off the inning with a bunt single and an error put a pair of runners on base. Gregg Russell drove in both with a single, before scoring on Tim Garrett’s hit to cut the deficit to a single run. But that would be as close as South Atlanta would get. “I just said after that inning, ‘They’re not getting another run,’ ” Lee said. “I didn’t want us to have any excuses in the end. I didn’t want the game coming down to the ninth inning.” A three-run eighth made sure it didn’t. A Kent single put runners on first and third with one out and both scored on Hurd’s single to push the lead to 6-3. Later in the inning with the bases loaded, Harvey was hit with a pitch to force in another run and put the game out of reach. D.C. appeared to be in position to run away with the game following a four-run first inning. A bases loaded hits batsman plated the game’s first run, before Andre Lambros’ blooper to center plated another. When an infield out and Tommy Morris’ bases-loaded walk scored two more runs, the Twins were faced with a deficit that even their powerful offense couldn’t overcome. South Atlanta reached the tournament championship game following a 4-1 round-robin effort, before blasting the Berks County Bombers, 12-2 and Bux-Mont Cubs, 16-4.